The year 2014 was one of the deadliest years for militants fighting against the state. Statistics released by the Conflict Monitoring Center (CMC) which is statistical division of Pak Institute for Conflict and Security Studies (PICSS) show that 63 percent of the total deaths in war on terror during 2014 belong to militants. According to the data 5374 people were killed including 3414 militants, 1233 civilians, 643 security forces personnel and 84 pro-government armed Razakars while 6611 people were injured including 3941 civilians, 893 security forces’ personnel, 512 militants and 64 pro-government armed Razakars. The CMC recorded 2838 violent incidents including militant attacks and security forces’ response which include 1618 militant attacks and 1221 security forces actions. The year was heavy on sleeper cells and urban networks of the militants too as 6608 suspected militant, their financiers and supporters were arrested from different parts of the country. This is for the first time during last four years that losses of militants were more than 55 percent of total deaths during Pakistan’s war against terror. It is worth mentioning that more than twenty thousand militants have been killed since 2009 when Pakistan started large-scale military operations against militants. Despite operation Zarb-e-Azb, peace talks and a ceasefire, the year 2014 remained most violent one during last five years. Militant attacks increased by 25 percent as compared to 2013 which was one of the major grounds to start operation Zarb-e-Azb. The year started with an unprecedented surge in militant attacks in first two months. Apparently it was retaliation of killing of Hakeemullah Mehsud who was eliminated by a drone strike in November 2013. Then nosedive was observed in next two months due to peace talk efforts. In May militant attacks once again escalated as peace efforts failed to materialize. The trend continued in June but in mid of June Pakistani military started operation Zarb-e-Azb and July saw a remarkable reduction in militant attacks. 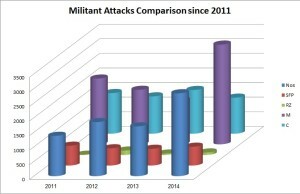 A slightly upward trend was observed in August and September which was temporary as consistent downward trend was observed which dropped the number of militant attacks to two digits in December 2014. Security forces response to militant attacks also saw mixed trends in first six months but remained consistent in later part of the year but an unprecedented rise was visible after militant attack on Army Public School in Peshawar. The response has apparently jolted the militants as the month of December 2014 saw lowest number of militant attacks. Pakistani military flushed out safe havens of militants from 90 percent area of North Waziristan during operation Zarb-e-Azb and secured vast area in Khyber Agency in subsequent operation Khyber-1. A nationwide intelligence based operation continued throughout the year in which more than six thousand suspected militants, their financiers, and supporters were nabbed. The countrywide operation helped in minimizing blowback of operation Zarb-e-Azb in North Waziristan. The Conflict Monitoring Center recorded highest number of militant attacks (477) in Balochistan followed by Khyber Pakhtunkhwa (464) where 527 and 650 people were killed. Highest number of deaths (911) in militant attacks were recorded in 380 militant activities in FATA but majority of the casualties were militants who were killed in retaliatory actions by security forces or infighting between two rival militant groups in North Waziristan before operation Zarb-e-Azb. In actions initiated by Pakistani military as many as 2278 militants were killed during the year. 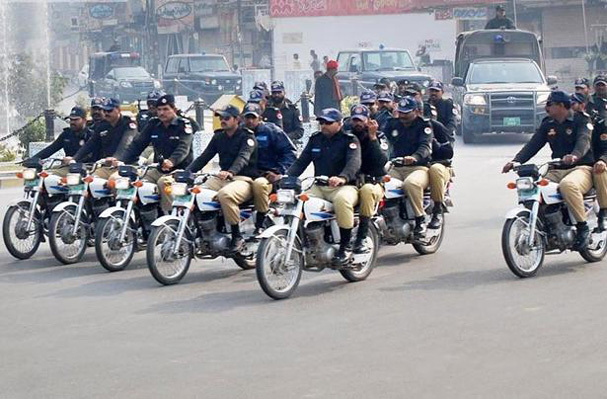 An unprecedented increase in militant attacks has been observed in Sindh and Punjab. In Sindh 246 militant attacks were recorded by the CMC during 2014 which is three times increase as compared to 2013. An alarming situation in Punjab saw almost four times increase in militant attacks as 40 militant attacks were recorded during 2014 which was only 11 in 2013. Suicide attacks also increased in Punjab which saw four suicide attacks during the year 2014.